I’ve never been one to go get my nails done every week, let alone every year! In fact, I think I’ve had maybe or four manicures and pedicures in my entire life. Don’t get me wrong – they are absolutely wonderful, but I can’t justify spending money on that kind of thing all the time. Just after I moved away from Arizona, I started to notice that Jamberry nails were beginning to pick up in popularity. For those of you who aren’t familiar with them, they are an adhesive nail wrap that stays on for up to two weeks on your fingernails and four weeks on your toenails. When I first looked at the price, I wasn’t sure I wanted to spend $15 on just one sheet, but the consultant informed me that each sheet is good for two to three uses. There was also a deal going on where if I bought three sheets, I got the fourth one free, so I decided to give it a go! Now, I have to admit that there was quite a learning curve my first time. I didn’t purchase the heater, so I had to resort to using my hair dryer instead (which worked fine for my purposes). 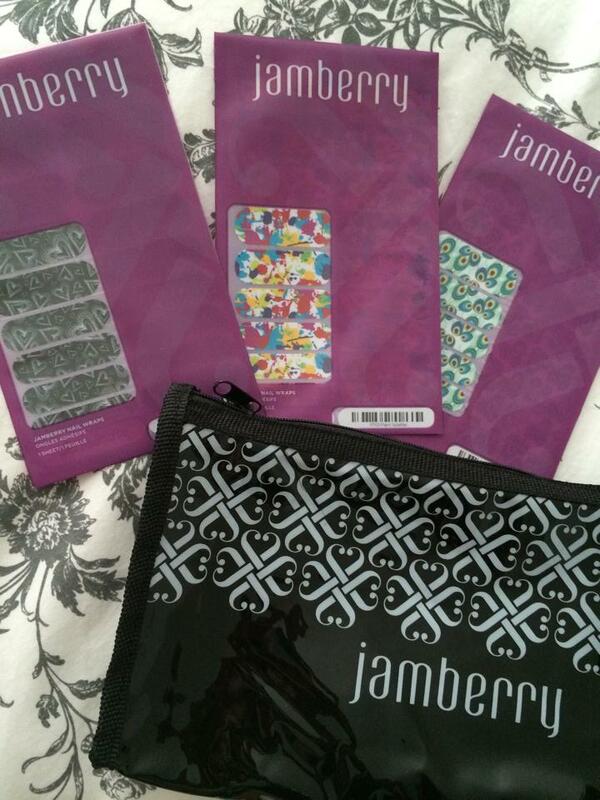 I did purchase the Jamberry nail care kit though, and I’m thankful that I did. 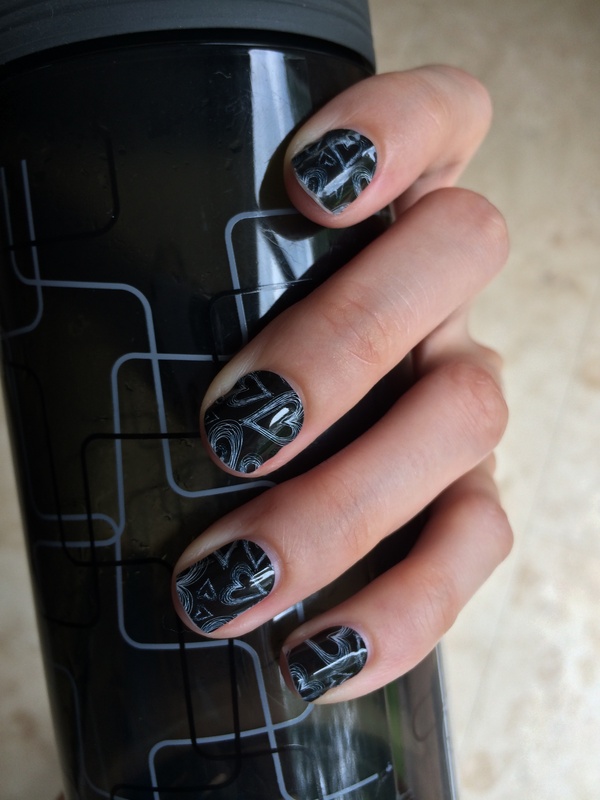 So with a patient spirit (ha) and the nail wraps ready to go (I chose chalkboard hearts first), I set out on my first adventure to achieve beautiful Jamberry nails. I think my first time took me about 40 minutes to complete, but I was so worried about not making them perfect, so maybe I was a bit too cautious. There were a few times when I had to reapply the sticker because I put it on crooked the first time. Thankfully, all you have to do is heat up the adhesive again so that you can lift it off of your nail and re-position it. If you look at the picture, you can see that they actually turned out pretty good! I ended up getting tons of compliments about them which was nice. I kept my Jamberry nails on for 12 days before using my hair dryer to peel them off. This is where the downside of having adhesive nail wraps came for me. Although the removal process was easy, I noticed that some of my nails were left looking a little rough afterward. Getting all the sticky goo off was also a not-so-fun process, but I managed to get through that without too much anxiety (I get very impatient over things like this sometimes). I absolutely loved this design because it was eye-popping and fun. Since this was my second time putting on the nails, it only took about 30 minutes to apply all ten wraps. Once again, I think they turned out great! One thing I really like about Jamberry nails is that the sheets come in a variety of sizes so that you can find the closest match for your fingers. 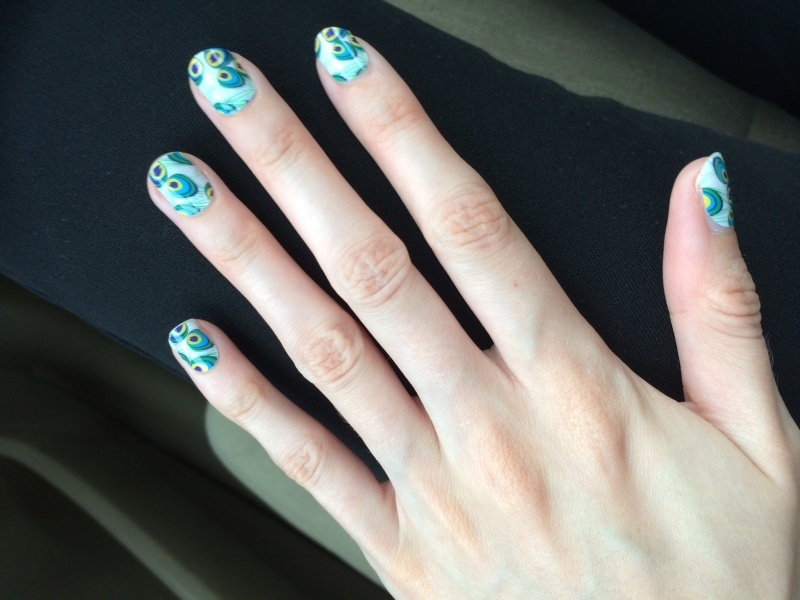 I kept this design on for about a week and a half before deciding to take them off. I’ve been very impressed with how well the nail wraps have stayed on both times I’ve applied them. The only thing I would emphasize to any potential customers out there is to make sure you file off any excess stuff you have hanging off your nail otherwise your hair (or anything else) will probably get caught in it (yes, I’m speaking from experience). As I said before, I had some issues with my nails being roughed up a bit after the removal process, so I plan on using a different technique in the future. Jamberry recommends soaking your fingers in polish remover for 20 to 30 seconds so that it has a chance to soften the adhesive. This approach, mixed with a gentle peeling off process, sounds like it will be the best option for those of us who worry about ruining our nails. Overall, Jamberry nails are awesome! I haven’t had a chance to wear my paint splatter design yet, but I’m very excited to put those on in the near future! This is a product that I’m happy to speak about because it’s stylish and affordable. Oh, and did I mention that there is a design studio that lets you create your own looks? I personally haven’t used this service yet, but I’ve seen the results and they look great! If you don’t want to waste your time with creating new ideas, then have no fear – the Jamberry catalog has tons of fashionable designs to choose from. Do you have experience with this product? I’d love to hear about it!